A little family history. Here’s a letter written by a Dutch reformed minister in New York to the Classis of Amsterdam on September 30, 1696. His name is Domine Selyns. 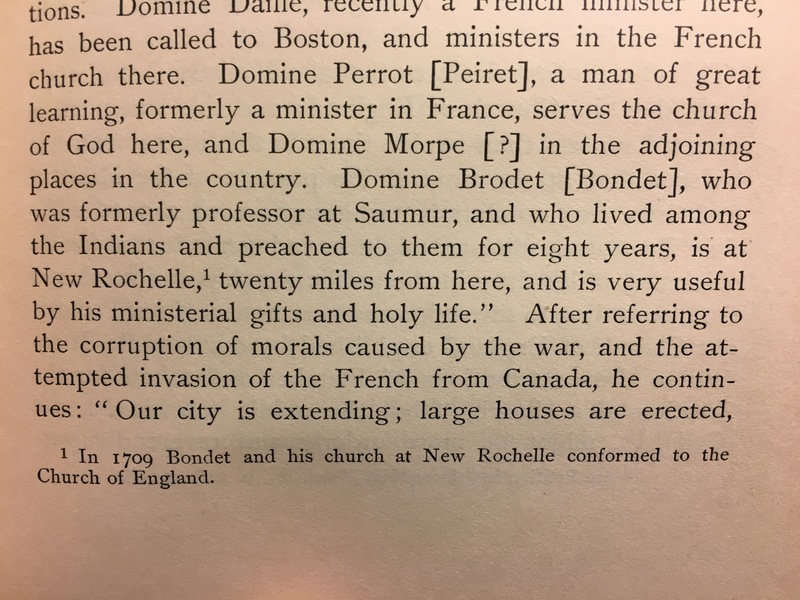 In the letter he mentions the French reformed minister who serves where my ancestors the Sicard family [bearing my paternal grandma’s maiden name] were settled in New Rochelle, New York. His name was Reverend (or Domine to use the Dutch title) Bondet, A Huguenot minister from France and a former professor at the famed Academy of Saumur. This was the pastor of some of our ancestors in of New York who had escaped France eight years before. A History of the Reformed Church, Dutch in the United States by ET Corwin, 115. General Assembly of the Presbyterian Church (USA) 1870, quoted in A History of the Presbyterian Churches in the United States by Robert E. Thompson, 1895, p. 199.